1. timeBeginPeriod is only on Windows. What’s the story for Mac? Linux? 2. If Flash changes timeBeginPeriod globally, then if you re-run Resig’s test with Flash enabled are the results better? I agree with Steve: this is one of the best articles I’ve read in a long time. And those pesky timers: always causing havoc! I’d also like to find out how timers were handles on Mac OS X and Linux â€” it’d result in a very insightful, real-world comparison of the different major platform’s timers. Regarding Resig’s test if Flash were running. No – it would not change the results for IE. I didn’t mention this in the article, but the time routine that you pick matters; you need to use one which uses a finer grained clock. Finally, yes, any program which uses timeBeginPeriod will drain your battery faster on Windows. This includes Windows Media Player, Quicktime, and old versions of Flash. The latest version of Flash (10.x) doesn’t use it. Here’s a picture of John’s test on Linux. As for how it works: you’ll need a bit more background, unfortunately. First, to be clear, Mike was posting about two separate things. (1) Windows timers aren’t hi-res by default; (2) browser timers have a minimum period that’s rather low-res. The latter probably historically came from the former but the two aren’t necessarily related. Regarding (1): the timeBeginPeriod business is only set up for a UI message loop, so I was initially confused because within a renderer on Win/Linux we use our “default” message loop (basically, a fallback message loop for bits of the code that aren’t interacting with UI or IO). One final important caveat: only on Mac we actually use a UI message loop even within the renderer, which means it’s actually going through the higher-level OS timer code. The code says it’s needed to make rendering work with Cocoa. I glanced at the Mac UI loop code but it’s a bunch of CF stuff and I know even less about Mac than I do Windows. I would be pretty surprised if they had a timeout limitation like Windows, though. To summarize, I think all the timer-adjusting workarounds are Windows-specific and it Just Works on other platforms, though I know very little about Mac. And the web-level timer adjustment is cross-platform code. Evan – thanks for the extra details. The Tickless Kernel Timers are nothing short of awesome on Linux – especially given the amazing granularity. As for Windows – if you’re going into any of the kernel waits, I think you eventually bump up against the system clock. It simply won’t wake you up at a lower interval. Maybe someone from the Windows Kernel Team will reply on here. So how does one get IE to do better on Resig’s test? I’ve tried the trick of doing the test with Windows Media Player running at the same time, but that doesn’t seem to work. I can’t say for sure what IE9 does internally. I’d guess they use a low-resolution clock timer API. But I’m speculating. Maybe someone from the IE9 team will reply here. For those curious about Mac & Linux: Chrome has hundreds of lines of code in it’s windows implementation in order to deal with the complexities of high resolution timers. On mac and linux, it’s literally a one liner. Probably a shot in the dark, but what about IE 6/7/8? Or, do you know someone who might know more on IE internals? is directly related to the Chrome timer implementation. Seems like I’m 6 months late to the party, but I disagree on some of the points being made there. What you are basically doing is making poorly written pages run faster at the expense of the rest of the system (both the performance of other tasks, and energy consumption). First there’s the fact that modern processors like to be in sleep states as long as possible. You are already aware of this. OS vendors are doing a lot of work to try and accomplish this. There’s a Microsoft presentation where they say they’re looking to enforce low wakeup rates for background applications (on the order of 100ms) on future OSs, because there are so many mis-behaved applications. Then there’s cache efficiency. It might not show up in “CPU usage” statistics (these are not very precise anyway), but touching memory 1000 times a second pollutes the CPU L2 cache. Context switches are expensive and they clear the L1 cache completely. However, the real question is why would you want to wake up 1000 times a second? Or 250? This is unjustifiable for 99.99% of all applications, and certainly all web pages existing today. You don’t even gain any perceived performance; no screen updates that fast. Look at the IE9 performance demos. They’re capped at 60fps. 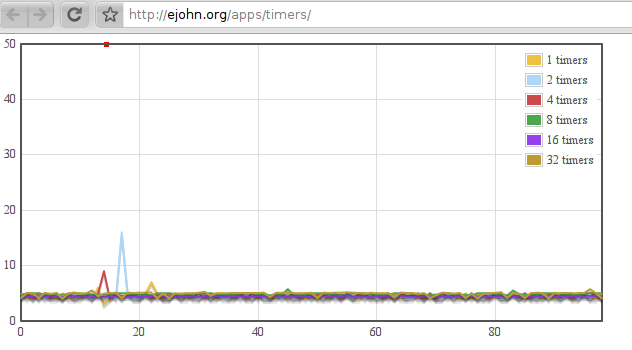 If you watch them in other browsers, the system timer still runs at low granularity (16ms). Yet they run smoothly at 60fps. Running them faster would not improve them a bit. Using 1ms timers usually means the person writing the code doesn’t know what he’s doing. He’s using a timer as a synchronization primitive, and just put the lowest value that doesn’t cause 100% CPU load. If some artificial benchmarks bother you that much, just lump timer firings together and fire them back-to-back every 16ms or so (so if the page requests 1ms, fire it 16 times every 16ms). Same end result, much better on the system. Firefox has some adaptive correction where if they see a timer fired late, the next one gets adjusted to compensate. That’s the reason they can do consistent 60fps without calling timeBeginPeriod(). They don’t fire multiple times though so they’re limited to that speed (apart from the 10ms limit). This runs at 60fps if possible, but if not the animation will run at the same speed (less smoothly). This is what any decent real-time application does nowadays. Otherwise you run into problems sooner or latter. This is not a tradeoff to make other applications run more slowly. If it is, please provide a benchmark to demonstrate. I’d also like to see a benchmark to demonstrate the L2 cache effects. 1000 interrupts per second is a mere 1Hz! Surely you appreciate that 1Hz is in the noise on a modern 2GHz system. If you do have benchmarks to demonstrate that these are real problems, I’ll be happy to work on new solutions. As for the rest, I don’t disagree with much that you said. Trust me, we’d rather not do this. And we only have to do it on Windows. Mac and Linux don’t have this problem. Other systems can dynamically adjust the hardware tick intervals to match the requirements of the application. (read up on tickless timers for more info) I’ve spoken to Microsoft about the issue, and they have been non-committal on fixing the underlying problem. The latest algorithm employed by Chrome is a user-level implementation to do precisely what Mac and Linux do natively. If no apps are requesting high precision timers, we don’t use them. But if an app asks for it, we enable it.